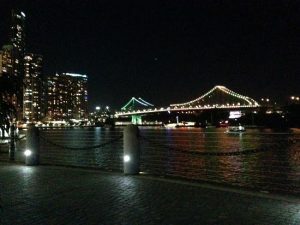 Venue: Fat Angel’s (briefly) and then Riverbar, Brisbane. Amby – Mojo shiraz from the Barossa Valley, Australia and then Malbec Tarrazas Reserva from Mendoza, Argentina. After a while between drinking sessions Kaner and Amby hook up again in a loud American bar for Independence Day before heading down to the Riverbar to throw Dip mud in each others’ face.